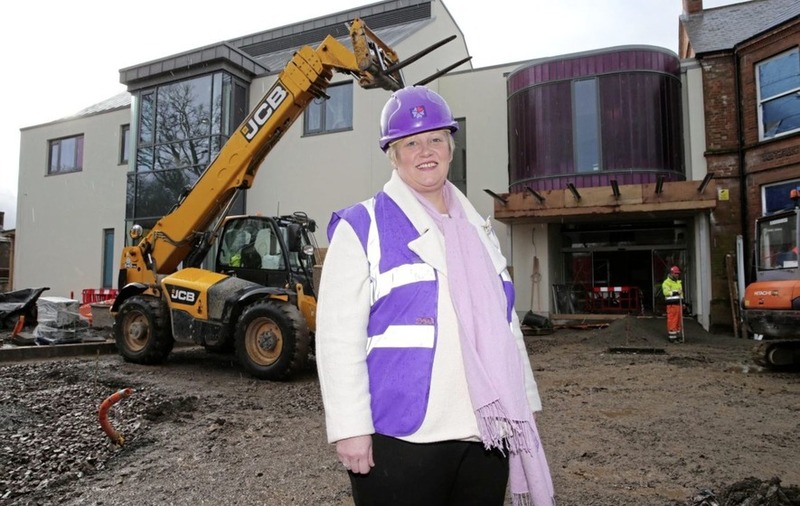 Heather Weir Chief Excutive of the NI Hospice pictured during building work at the Belfast facility in March 2016. The new upgraded facility opened in May this year. TERMINALLY ill patients are being placed on waiting lists for hospice beds as cuts to care packages are preventing inpatients from being discharged home, it has emerged. A spike in the number of cancer patients in their thirties and forties being admitted for end-of-life care has also created further demands as they cannot be referred to nursing homes - which are often used as an alternative when a care home package isn't in place. 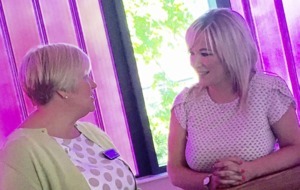 In an interview with the Irish News, the chief executive of the Northern Ireland hospice said that since the new £13 million upgraded facility opened in north Belfast in May, their 18 beds have been fully occupied. Heather Weir, who is a former hospice nurse, said that a number of factors had contributed to a situation in which patients were now experiencing delays for specialist treatment in their final days and that as a result respite care had been reduced. Earlier this month, a woman in her fifties with cancer was told there were no hospice places available. She was finally admitted just days before her passing. "We don't have any empty beds, as soon as the bed is empty it is filled again," said Ms Weir. "But we are seeing a bit of a trend in last few months - and it's one of those things that you can't predict - of more younger people in their 30s, 40s and 50s coming in. "For them, an alternative place of discharge to a nursing home is not suitable. So for a lot of people, where the nursing homes are potentially absorbing the impact of lack of domiciliary care places, for these younger people it is not appropriate. "We would do emergency admissions if we have a bed but when we are sitting with a full occupancy rate, it's become really very tricky for us to decide who gets a bed.We are effectively managing a waiting list - and given this is the winter we are seeing more people who are being referred who have to wait." The hospice chief, who has been in post for almost three years, said anyone who is on a waiting list would face delays of "days" and "not weeks". She added that most people's preferred option was to be treated at home but that some families were finding it increasingly difficult to manage end-of-life care on their own. And while there has been an increased investment in specialist community nurses, the hospice remains most patients' preferred option for palliative treatment. "Our specialist community nurses try to keep people at home where they want to be," Ms Weir added. "But certainly the cases we see are very complex, where nurses and GPs have reached their limit in the community in terms of prescribing and treatment. "Caring for someone at end of life can be long and drawn out - people think it's a few nights of sitting up, but it can go from a few nights to a few weeks and that's when we tend to get the crisis referrals. "It sounds a bit bizarre, but it's the people who have hung on - that's when we get the eleventh-hour referrals." Caring for around 3,000 seriously and terminally ill patients a year, the majority of the hospice's work is in the community. It is estimated the Somerton Road new-build will save the NHS almost £3 million a year in bed days alone. It also provides support and counselling for families. The average stay of a patient in the north Belfast facility is between 10 and 15 days before they are discharged home. 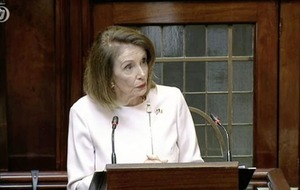 Ms Weir said the collapse of Stormont and cuts to care package were among a range of factors that had led to the current difficulties. "There was a case recently where we resolved all the patient's specialist palliative care needs and they were ready to go home - but we couldn’t get the care package that they needed. So that person opted to go to a nursing home while they waited for a domicilary care package. 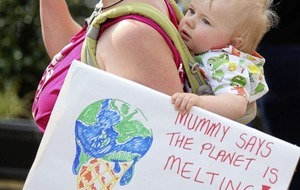 "Over the last six months we're seeing more young parents with cancer. Whenever they present there is the whole complexity with social circumstances as well." Ms Weir said an increased investment in their beds numbers would help in addition to enhanced community services. The Department, which has an annual budget of £5 billion, provides less than 30 per cent of the annual £10 million it costs to run the adult hospice on the Somerton Road and the children's regional hospice in Newtownabbey. "What we would really like is a rapid response palliative care team. Everything can stop on a Friday at 5pm - it is then our hospice nurse would go into a home as someone who knows about the drugs, who knows how to handle things. It makes a big difference for the family, and can make the difference between an eleventh hour emergency call or not. "Our ambition is to work in partnership with government and for that to reflect 50/50 funding - with 50 per cent of funding from ourselves as a charity and 50 per cent from the Department of Health."